This old soldier’s memory notwithstanding, during the early part of the war filling the ranks of the regiments was more important than the medical readiness of the recruits and physicians often turned a blind eye to many disqualifying conditions. Induction physical examinations used the pass rate as a measure of success ensuring that recruits with all their limbs, good teeth (for tearing rifle cartridges) and adequate sight/hearing would be retained for service. As one regimental surgeon put it, “Many of [the soldiers] ought never to have come out, having broken constitutions or bodily defects which entirely disqualify them for the life of a soldier.”[iii] In fact, some of the examinations were so superficial that women were able to enlist pretending to be men. NOTE: The National Museum of Civil War Medicine has an excellent exhibit on physical examinations for recruits. The excitement of the recruiting station often obscured the need for a thorough physical examination. The purpose of these examinations for the Connecticut troops was unclear coming some five weeks after the organization and activation of the regiment. 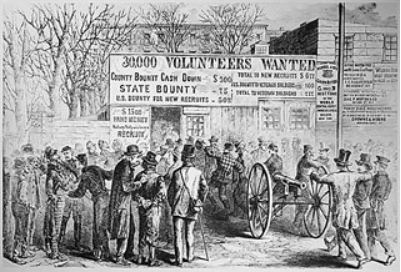 It may have been related to the fact that in August of 1861 the Army began to make an attempt to weed out many of the volunteers who were not physically qualified by requiring additional and more methodical examinations. This included follow up exams for those regiments already in service. Oliver’s emphasis on “this” when referring to the examination seems to indicate that a previous examination had occurred at some point in the past likely during the recruiting of the companies of the regiment. However, it is clear from his letter that the earlier examination did not include disrobing when standing before the physician. Also, the commander and/or the regimental surgeon may have had concerns about the physical condition of some of the soldiers. Whatever the situation driving the requirement for the new physical scrutiny of Oliver and his comrades, at least five soldiers from the Eighth Connecticut were discharged for being found to be physically unfit within a few days of this examination as indicated by the company rolls. In the case of Private Case’s physical examination, he expressed a great deal of concern about the possibility of being dismissed from the regiment due to the lingering signs of some previous illness that he does not specify. He wrote to his sister, Abbie, that the doctor “questioned me pretty close about that breaking out on my shoulders – there is hardly anything left but the scars.” Obviously, Abbie was familiar with this illness because Oliver wrote that “if he had seen it two months ago [which places it prior to his enlistment while he was still living at home in Simsbury] I would have gotten thrown overboard…”[v] It’s unclear from the information that Oliver provides in his surviving letters the exact cause of the “breaking out” on Oliver’s shoulders. Based on the common aliments of the time, several possibilities exist including something as simple as dermatitis or a more complex condition such as a past bout of chicken pox which would explain the presence of scarring during the exam. Whatever the condition, the crisis of possible discharge was quickly overcome by Oliver explaining to the examining physician that the scars were “nothing but a little breaking out and had not been there a great while.”[vi] This obviously satisfied the doctor and Oliver was allowed to continue his service in the 8th CVI. In a tragic irony, this would be the first of several recorded instances of Oliver experiencing a close encounter with potential discharge from service. This entry was posted in Long Island and tagged Camp of Instruction, Connecticut, examination, physical. Bookmark the permalink.